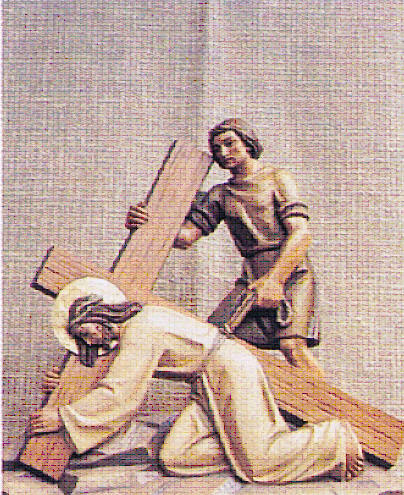 The stations, His way of the cross, are our way of salvation, too. We must often apply their power to our own life situation. This can be done anywhere, at home, on a park bench, waiting for a train, or a friend. 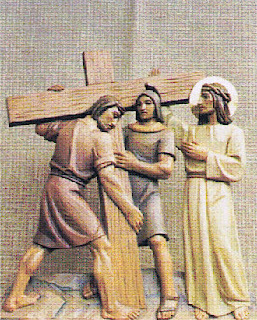 Let us make His way of the cross our way of life. 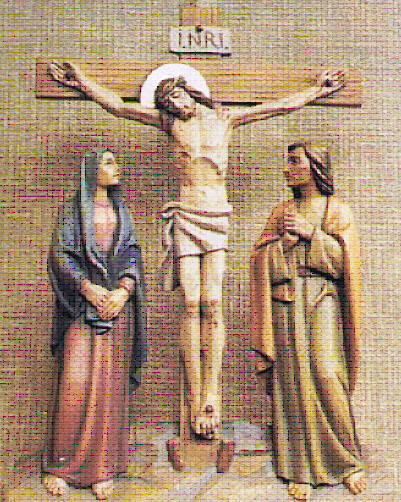 The Way of the Cross is a devotion in which we accompany, in spirit, our blessed Lord in His sorrowful journey to Calvary, and devoutly meditate on His suffering and death. All that is required to gain the indulgence is to meditate for a few minutes at each station. No vocal prayers are necessary. However, those prayers printed here may prove helpful. God, our heavenly Father, we raise our minds and hearts to you in praise and thanksgiving. Though weak and sinful, we wish to follow your only Son, our Lord Jesus, on the way of the cross. May your Holy Spirit help us use our Savior’s strength effectively in our place in life. We ask the special aid of our blessed Lady, ever Virgin and Mother, in following Christ and in making His way of the cross our way of life. Amen. Almighty, ever living God, you have given the human race Jesus Christ our Savior as a model of humility. He fulfilled your will by becoming man and giving his life on the cross. Help us to bear witness to you by following his example of suffering and make us worthy to share in his resurrection. We ask this through our Lord Jesus Christ, your Son, who lives and reigns with you and the Holy Spirit, one God, for ever and ever. Amen. And they all gave their verdict; he deserved to die. Found guilty though innocent, unjustly judged, our Master accepted a perverse human verdict. He knew God has the last word. We, too, must imitate Christ, pray for the wicked, and leave the rest to God. 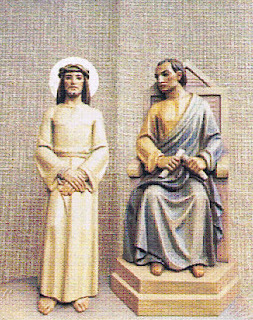 Pilate handed him over to be crucified. All of us who follow Christ will have our own cross to bear. By imitating our Lord the \cross we carry becomes a means of salvation and final victory both for ourselves and for others as well. MEDITATION: Jesus is given a cross to carry on His bleeding and bruised shoulders. He takes this cross upon Himself as He takes upon Himself all of our sins. I looked: there was no one to help. Even our blessed Lord staggered and fell under the weight he was bearing. He had no one to aid Him. Christ is with us when we stumble; He is eager to help us. Turn to Him now and ask His aid. 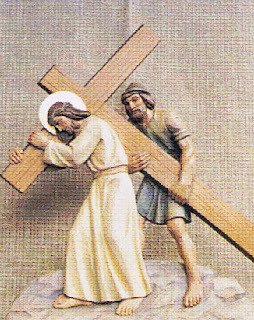 MEDITATION: Jesus, weakened by all His suffering, stumbles and falls on the way to Calvary. He struggles and rises, despite His pain, to go onward toward His death. Woman, this is your Son. 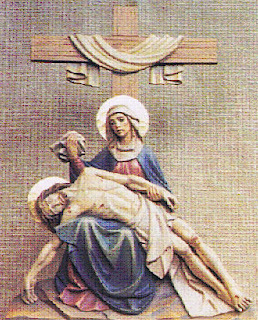 Our Lord gave His holy Mother a part in His suffering so she might fully share His victory and glory. Our Lord, Jesus, gives us this same chance to loin Him in sorrow so we may share their great by. Now, her grace-filled smile blesses his mission and stirs his heart to its depth. 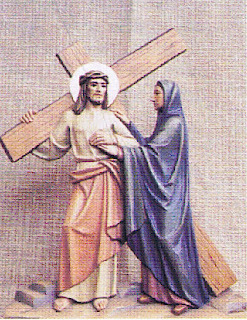 MEDITATION: Jesus, on His way to Calvary, sees His Mother. Both are stricken with grief. Her love for Him is surpassed only by His love and concern for her. They seized on a man, Simon from Cyrene, and made him shoulder the cross. 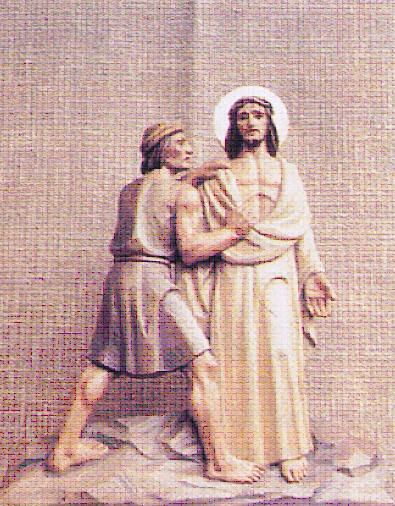 Simon resisted until he learned how easy the yoke, how light the burden when carried for Christ. Never let our natural, human fear of pain keep us from the tasks we meet on our journey to eternal life. MEDITATION: Jesus is growing weaker. 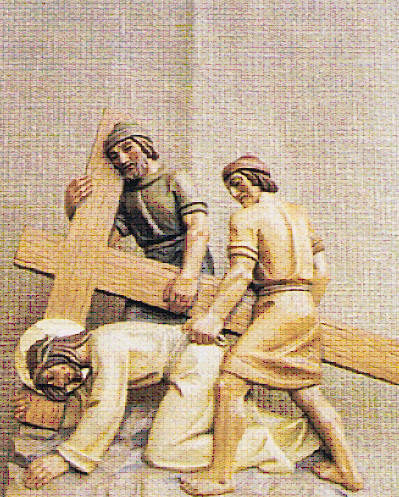 Fearing that He may not be able to go on, His executioners force Simon of Cyrene to help Him carry His cross. In so far as you did this to one of the least of these brothers of mine, you did it to me. Veronica’s instinctive act of pity will be recalled forever. Anything we do for anyone Christ counts as done for Him. So never hesitate to do good to others whether they deserve it or not. God will never forget. MEDITATION: Jesus’ face is bathed in sweat and blood. Veronica, moved by pity, wipes His face with her veil and the image of His holy face is imprinted on the cloth. He was praying all the time for sinners. Christ’s weakness made Him fall again, but He went on. When we weaken, when we falter and fall, our Savior knows from His own experience how hard our way is. He will be our strength, our helper in every difficulty. MEDITATION: Jesus falls again under the weight of the cross. 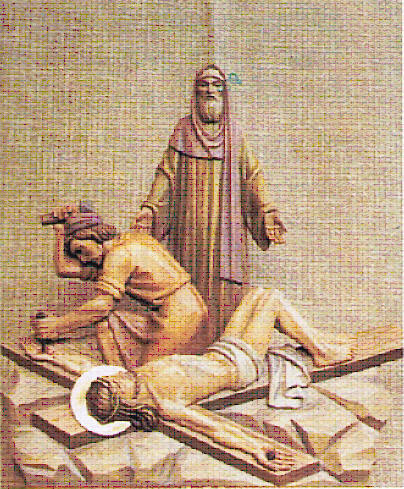 His executioners drag Him to His feet and force Him to go onward to Calvary. Weep rather for yourselves and for your children. Jesus did not think of Himself, he thought of others, of the sufferings His people would yet have to endure. When we act like Christ, and think first of others, our own trials seem somehow easier to bear. They leave me lying in the dust of death. His final fall reflects the frailly of Christ’s human nature. Yet, He went on. We often have proof of our weakness, too. Yet, we show fidelity to God by going on in spite of our infirmity. MEDITATION: Jesus, weak and exhausted, falls for the third time. Though He hardly has strength to move, they try to make Him walk faster. They shared out his garments by casting lots. Our Lord’s clothing was taken away. So in spirit must we also separate ourselves from our material possessions. Eventually, we must part with them. Be generous always with the gifts God gives you for a time. MEDITATION: Jesus has reached the summit of Calvary, the place of His execution. As they strip Him of His garments, they reopen His bleeding wounds. They crucified him there and the two criminals also. 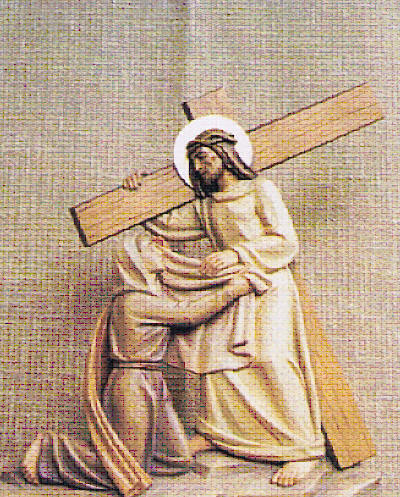 Fastened hand and foot, moving only with pain, how humiliating to be nailed at last to your cross! 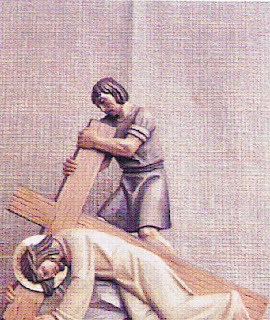 MEDITATION: Jesus is now thrown down upon the cross. His executioners violently stretch His limbs and fasten them with crude nails to the wood. All of us must someday die. With God’s help we will meet death as Jesus did. Final bodily defeat is turned by God into our first moment of triumph. Having died with Christ we will rise and reign with Him. MEDITATION: Jesus is crucified. After three hours of agony and pain, He commends His spirit to His Father, bows His head and dies. Now let God rescue him if he wants him. Christ’s death is ultimate proof of His humanity. Unless He was human, He could not have died. Unless He was also God, His death could not save us. “Ours were the sufferings He bore.” Now we must be dead to sin. MEDITATION: Jesus’ lifeless body is taken from the cross by His disciples Joseph and Nicodemus. Tenderly, they place Him in the arms of His sorrowing Mother. 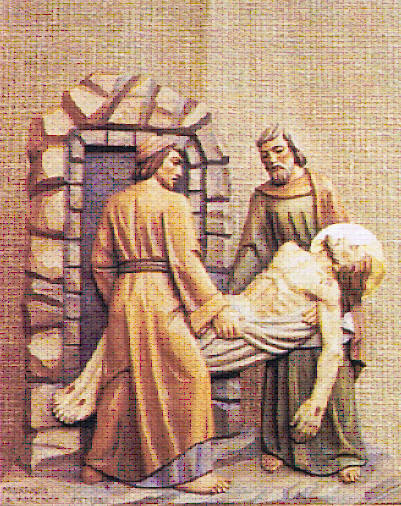 He then rolled a large stone across the entrance of the tomb. They take the body of Jesus to its resting place. We see Christ’s body laid to rest, but no grave can hold the Lord of the Universe. He rises again to new life with God living always to intercede for us while we continue His work here on earth. MEDITATION: Jesus’ body is wrapped in a shroud and placed in a nearby sepulchre of a friend. Then a large stone is rolled against the entrance and they depart. Hail Mary, full of grace, the Lord is with you; blessed are you among women, and blessed is the fruit of your womb, Jesus. Holy Mary, Mother of God, pray for us sinners, now and at the hour of our death.Amen. You, o God, overcame death through your only-begotten Son who opened for us the gates of life eternal. Help us, then, to carry out in our lives the desires you inspire in us. This we ask through the risen Christ, our Lord, who now lives and reigns with you in the unity of the Holy Spirit, God, for all the ages. Amen. Father of Providence, look with love on our Pope, your appointed successor to Saint Peter on whom you built your Church. May he be the visible center and foundation of our unity in faith and love. Grant this through our Lord Jesus Christ, your Son, who lives and reigns with You and the Holy Spirit, one God, for ever and ever. Amen. 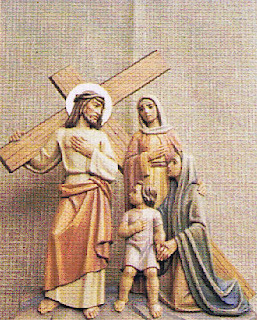 A plenary indulgence is granted to the faithful, who make the pious exercise of the Way of the Cross. Those who are “impeded” can gain the same indulgence, if they spend at least one half an hour in pious reading and meditation on the Passion and Death of our Lord Jesus Christ. Photos in booklet token From works of Vincenzo G. Mussner, Woodcarver.